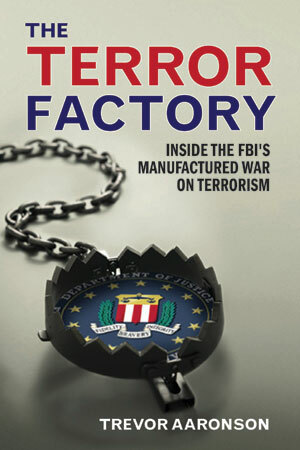 Trevor Aaronson is author of The Terror Factory: Inside the FBI’s Manufactured War on Terrorism (Ig Publishing, January 2013). He is also a reporter assigned to the Washington, D.C.-based investigative unit at Al Jazeera Media Network, a global news network whose channels include Al Jazeera America and Al Jazeera English. Before joining Al Jazeera, Aaronson co-founded and served as director of the nonprofit Florida Center for Investigative Reporting, which won national and regional journalism awards under his leadership. Killing Oswald trailer from E2 Films on Vimeo. Who remembers RAWSTORY before being infiltrated? MIT professor Noam Chomsky doesn’t know what happened to “Building 7″ of the World Trade Center on September 11, 2001. But he is convinced that so-called “9/11 Truthers” don’t have the answer. During a lecture on “Policy and the Media Prism” at the University of Florida a few weeks ago, 9/11 truth activist Bob Tuskin said the mainstream media had covered up evidence that Building 7 imploded in a controlled demolition. Tuskin asked Chomsky if he was finally ready to “jump on board with” 9/11 conspiracy theories. In this week's special documentary episode of the podcast, we explore the life and legend of Lee Harvey Oswald. Was he a poor, disgruntled loner or an overachieving marine? A presidential assassin or a sheep-dipped patsy? Find out in this week's edition of The Corbett Report. This show was broadcast August 12, 2013. This show was broadcast August 19, 2013. This show was broadcast August 26, 2013. This show was broadcast on September 2, 2013. This show was broadcast on September 16, 2013. Scientists find at least 18 times the normal levels of radioactive element in late Palestinian leader’s remains. Paris, France - Swiss scientists who conducted tests on samples taken from Yasser Arafat’s body have found at least 18 times the normal levels of radioactive polonium in his remains. The scientists said that they were confident up to an 83 percent level that the late Palestinian leader was poisoned with it, which they said “moderately supports” polonium as the cause of his death. Snowden's revelations about the NSA has seen US intelligence bosses go to great lengths to justify their activities. Officially they've been told to use 9/11 as their main argument, according to a document leaked in the media. And some politicians are happy to follow that advice. Pepe Escobar joins RT to discuss this issue.